Current discussion in the futures research field has raised the question of future consciousness. In this course students approach the definitions and implementations of future consciousness from their own research topics and perspectives. Main target in the course is to perceive, describe and construct definition and meanings of future consciousness and its relations to anticipation and the value theories and research. After the course students are able to a) define, describe and critically discuss about questions of future consciousness, anticipation and values, and b) produce and evaluate future orientated scientific articles. Further information and email: sari.soderlund(a)utu.fi. Note: Registration is now open! 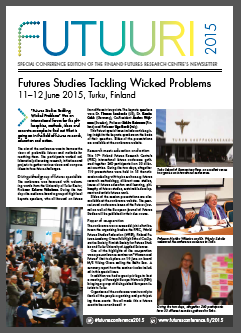 – 11–12 June: Participation into the Futures Conference “Futures Studies Tackling Wicked Problems: Where Futures Research, Education and Action meet”.